Rural life in North America is happily spent on daily routines, rigorous work, and cheerful cooperation. However, this way of life has become an enigma to most people as a majority of the population now lives in urban or suburban areas. There are many unique stories in rural life - some little known. The equine ranching story, and its tremendous medical contribution, is one of these stories. It is a story of ranch families in the Canadian prairies, the horses under their care, and the tremendous partnership between agriculture and women's health care worldwide. For many years, scientists have known that as a woman ages, her body chemistry changes due to diminishing amounts of estrogen; this condition is called menopause. In searching for a way to alleviate this condition, scientists found that by replacing estrogen in women during menopause, uncomfortable symptoms were alleviated. The scientists tried sourcing estrogen from humans along with animal models, but soon discovered they were not able to collect sufficient quantities. They then found that horses produced the best known grouping of the critical estrogens required, and in a quantity able to meet the demands of women into the foreseeable future. Mares that are confirmed pregnant, produce pregnant mares' urine (PMU) from which the estrogens are extracted through a 125-step process -- one of the most sophisticated in the pharmaceutical industry. This estrogen is used to produce Premarin®. Premarin® is made by Pfizer, one of the world's leading pharmaceutical companies, and is taken to relieve menopausal symptoms. Premarin® is the most widely studied estrogen therapies in the world. More than 3,000 scientific studies of estrogen have used Premarin® to help health care providers better understand the benefits and risks of estrogen therapy. In producing Premarin®, a unique partnership between equine ranching and healthcare has come to life. Equine ranchers now involved in this partnership were horse breeders long before they became involved in equine ranching. To become a contracted equine rancher, these ranchers face close scrutiny of their equine ranching practices. Once they become equine ranchers, all ranchers must adhere to the "Recommended Code of Practice for the Care and Handling of Horses," which specifies standards for nutrition, watering, exercise, and barn environment among other standards. Equine ranching is the most highly regulated horse ranching activity in North America. Pharmaceutical company inspectors visit the ranches about once per month each year to check the horses and the facilities, and to make sure the ranchers are meeting their contractual obligations. 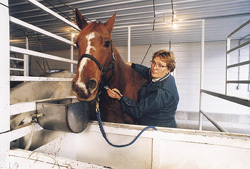 In addition, veterinarians and animal welfare representatives of the provincial departments of agriculture have authority to come on to the premises at any time to monitor the horses on the ranch. From time to time there are international veterinary and welfare groups who inspect ranches to monitor the health and welfare of the horses. These groups have included the Canadian Farm Animal Care Trust (CANFACT), the American Association of Equine Practitioners (AAEP), the Canadian Veterinary Medical Association (CVMA), and the International League for the Protection of Horses (ILPH). These prestigious groups have issued a report, "Consensus Report on the Care of Horses on PMU Ranches" as well as other reports have been issued. June to July begins the lazy days of summer for the horses and for the ranchers. The rancher will put the horses out to pasture - one stallion with each band of mares - which is how horses live in the wild. The reason for this is two-fold: it allows the rancher to promote particular bloodlines and breeding crosses, and it allows the horses to breed naturally. When the long and warm days of July are over, the stallions are removed from the mare bands. As a result of the excellent health of these mares coupled with the fact this is the closest method of horse breeding to that of "mother nature," the conception rates are typically greater than 90 percent. The normal gestation length of mares is eleven months and a healthy mare produces a foal each year - just as she would in the wild. Those mares that bred the year before will have a foal at their side during the time of conception and it is actually this category of mare that veterinarians indicate have the best likelihood of conceiving again. Natural weaning will occur as fall approaches and arrives -- but not before -- as the "Code of Practice" dictates that no foals can be weaned before September 1 each year. So September begins one of the busiest times of the year on the ranch -- that of weaning and horse sales. It is September and the countryside is buzzing at sale time. Whether the weaned horses are sold privately, at auction sales, or at on farm production sales, there is a horse for everyone regardless of breed preferences. Horse enthusiasts come from many U.S. states and most Canadian provinces to buy horses bred on equine ranches. The equine ranchers are able to provide the quality horses demanded by the marketplace - and at affordable prices! The North American Equine Ranching Information Council (NAERIC) promotes several programs that reward buyers of these horses and some of the activities in which they are involved. 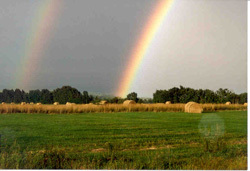 Until this time, mares and their foals are together enjoying lush pastures. Leading up to the exciting horse sale season, when foals are approximately four months old, they will be weaned from their mothers. This is an appropriate age for weaning horses, according to the most up-to-date horse management recommendations. After the weaning process is complete, the majority of foals are sold privately or through breeder production sales in early autumn. As fall sets in and pasture grass becomes drier and less plentiful, the mares are brought back to the ranch stables and reintroduced to the hay and oat diet that will carry them through their pregnancies. 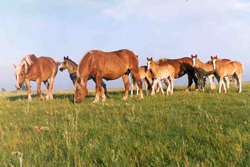 Broodmares spend the bitter prairie winters, approximately six months, in the barns. During the rest of the year, they are turned out on hundreds, and in some cases thousands, of acres of pasture. From fall to early spring, ranchers are busy taking care of the mares during the PMU collection season. During this time, mares are housed in temperature-controlled barns, which are approximately 40 degrees Fahrenheit, shielding them from the outside temperature, which may reach minus 40 degrees Fahrenheit throughout the harsh winter. Each horse is stabled in its own stall, the size of which varies depending on the size of the horse, with adequate bedding -- typically straw, wood shavings, or sawdust. The urine collection system consists of a lightweight, flexible pouch that is suspended from the ceiling by rubber suspension lines. The mares adapt very well to this system, which provides a full range of motion and allows the horses to lie down comfortably. Ranchers provide food and water for the horses in accordance with the nutritional standards provided by the National Research Council's Nutrient Requirements of Horses. In most barns, hay is available continuously, while water is delivered multiple times per day by automated watering systems, designed to keep stables dry. Mares are given water at least five times per day and allowed as much water as they want each time. During each collection season, veterinarians visit the ranches at least two times to complete full-herd health reviews as part of a formal program with oversight from veterinary representatives of the Saskatchewan and Manitoba Veterinary Medical Associations. "Once the horses are fed in the morning, the automatic water systems are checked, and the horses are all inspected, we then get the chance to go back in for our breakfast which often times has not only family members but any hired hands joining us. After breakfast we begin to turn out mares into the exercise paddocks, many times in groups of 10 or more depending on the size of the stable. Collection systems are hosed down with hot water and pressure sprayers if needed, stalls are repaired, and the barn is cleaned which pretty much takes the entire morning. My wife always has a country dinner ready for all of us at noon." "[When] the kids get out of school in the afternoon, they typically come right to the barn to begin their 'chores'. Because this is a family operation, we really depend on them doing their share to take care of the horses. In the late afternoon, we bring the mares back into the stable from their turnout pens and then begin the feeding process again. Our final pass through the barn is done just before bedtime to ensure the mares are settled in for the evening. While our days are hopefully routine, trust me, we sleep well at night before we start it again the next morning!" Spring thru early summer is foaling season and it is about this time when estrogen levels in the mares' urine drop significantly and the horses are turned out on pasture to foal and breed. Because the pastures have not yet bloomed and are not capable of sustaining the horses, ranchers continue to feed the horses hay and dietary supplements, allowing the transition to grass as the dietary staple to take place slowly. During foaling season, equine ranchers, with help from their veterinarians, monitor the process to ensure the health and welfare of the mares and foals. Mares typically foal outside in the green grass and warmer temperatures that arrive in early summer and the ranchers check mares each day to determine foaling progress and to record the new arrivals. As another day concludes on the prairie, equine ranchers and their families can be proud of their hard work and for the excellent care they provide for all the horses under their care. It is another day strengthening the partnership between agriculture and medicine - contributing to the health, well-being, and comfort of millions of women. And although those living in the urban and suburban areas may have forgotten about how life is out on the farm, hopefully, they will not forget the benefits the farm gives them.